The figures are placed in a roundel, set against a background painted to imitate mosaic. Poetry sits in the centre, holding a closed book and a stylised lyre, and wearing a poet's laurel wreath in her hair. The bank of clouds on which she sits also support a putto to either side of her, each holding a plaque which carries an inscription. As noted by Cook and Wedderburn, the photograph reproduces part of Raphael's ceiling decorations in the Stanza della Segnatura in the Vatican Palace, decorated for Pope Julius II from 1508 to 1511. 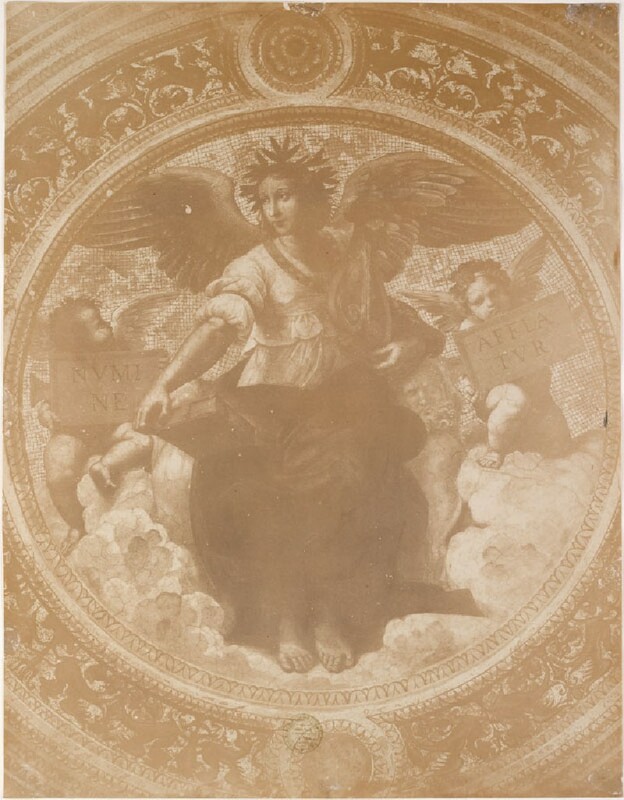 Poetry was one of four roundels, each depicted above the centre of one of the walls of the room, the others containing Theology, Justice and Philosophy. The wall below Poetry was decorated with a scene on Parnassus. The photograph was first catalogued in the "Catalogue of Examples" of 1870, when Ruskin listed it as no. 18 in the Standard Series (between a photograph of "Justice" from the same ceiling, and an engraving of "Parnassus", on the wall below "Poetry" in the Stanza). It retained its position in the 1872 catalogue of the series. Ruskin simply drew attention to the grandeur of the depiction of light and shade in the picture. centre, in graphite: NB. offset [?] on | backing card. 19. Poetry. (Raphael.) Photograph from the Vatican fresco. The light and shade, at least so far as the photograph may be trusted, is grander in this design than in the Justice; and it must always be remembered that the breadth of its treatment by great masters is necessarily lost in line engravings, for which loss, nearly total, we must allow in the next example.